Are you looking to buy a business? Have you stopped to think about whether you want to employ some or all the existing employees? Many new business owners fail to take this into account and as a result end up with new employees whom they wish they had not employed. What's more they find out that as the new employer they now owe various obligations to those employees. This situation can be avoided by analysing staffing levels and paying the same attention to the employment aspects of the business purchase, as you do to the financial considerations. Once you have determined the staffing levels you wish to have for the operation of the business you are in a position to negotiate new employment agreements with the staff you wish to employ. These people will often be the existing staff. It is preferable, but not always possible to do this before you actually purchase the business so that you know from day one who your employees are, and the terms and conditions of their employment. For example your analysis may show that that the business is overstaffed in customer services but that the business could do with another employee in production. You are in a much better position to address this issue before you buy the business than you will be if it is left until after settlement. Addressing these issues before settlement will usually involve the co-operation of the vendor of the business who can assist in arranging time for you to conduct staff interviews etc. You also have the ability to set the terms on which you will employ your new staff. However after settlement you have automatically become the new employer. It is much more difficult to try and negotiate new agreements after settlement. For example what will you do if you have taken over the business and the staff won't sign the employment agreements you have given to them? You are left in a very difficult position, you can't just terminate their employment because they won't sign. It is much easier therefore to deal with this issue before buy the business. These negotiations are often started by providing the prospective (new) employees (remember they are new employees as far as working for you is concerned) with a draft employment agreement. 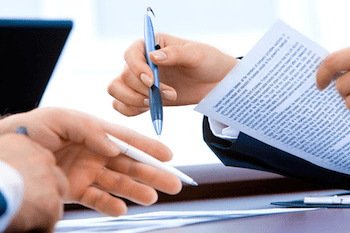 It is important to remember that you must have a written employment agreement with all the people you hire. Each of your prospective employees is entitled to obtain independent advice about the agreement you have given them. They may wish to discuss some of the conditions with you, they may want you to change some of the conditions, and some may not even want to work for you. You must approach these discussions in good faith and make sure you do not do anything to mislead the people you are negotiating with. Hopefully your conditions will be acceptable - the employment agreements can be signed and then both you and the new employees will commence a new employment relationship. If after discussions you can't reach an agreement you may elect not to proceed further. It will then be up to you as the employer to make an offer to a new candidate. The main point to remember is that it is important to address this issue. All too often it is overlooked because purchasers and their advisors focus only on the commercial aspects of the transaction. This article has been supplied by Employment Law Services - Auckland. The purpose of this article is informative only. It should not be relied upon as constituting legal advice. It is strongly recommended that if you are dealing with employment issues as part of a business purchase that you contact an appropriately qualified professional.